The Accentors are a small family of Eurasian passerines; all are assigned to the single genus Prunella. These are small birds with pointed bills, mostly of high elevation or high latitude species. One of these is Black-throated Accentor (left, in a very nice shot by Matt Matthiessen). The species breeds in two disjunct mountain ranges — the Urals of northwest Russia and the Altai and Pamir Ranges in west-central Asia — with these populations moving to semi-desert in Afghanistan, Pakistan, or the western Himalayas in winter. The one photographed here was a migrant at 13,000' (4000m) in northwest India. The family also include the familiar backyard Dunnock P. modularis of Europe. Accentors are mainly terrestrial birds, often feeding close to scrub or boulders. They move with a shuffling gait, but can run. They eat mostly insects in summer but often switch to seeds and fruit in winter. Over half of the high-elevation accentors are resident or undertake only short-distance down-slope altitudinal movements in winter. One of these species is Robin Accentor (right), a bird of the Tibetan Plateau from Pakistan to central China. 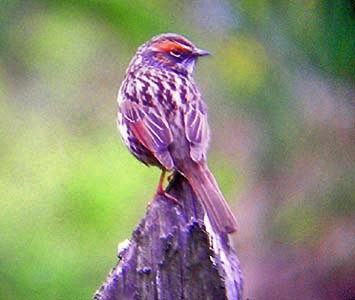 It could be the most colorful of the accentors, although Rufous-breasted Accentor P. strophiata of the Himalayas also has a broad rufous chestband. The relationships of accentors to other families has been obscure. Some anatomical features are thrush-like but biochemical evidence places them most closely to wagtail and pipits (e.g., Sibley & Ahlquist 1990) or to weavers (e.g., Barker et al. 2004). It is still not entirely certain where within the Passeroidea they belong. They are somewhere at the base of that lineage, as is another obscure high-elevation bird of the Tibetan Plateau, Przevalski's Finch Urocynchramus pylzowi, now assigned to its own family Urocynchramidae. A few species from high latitudes migrate substantial distances, and chief among these is Siberian Accentor (left). It primarily migrates from northern Eurasia south to central and eastern Asia. This long migration route has spun off vagrants to the New World where vagrants have been recorded in Alaska, British Columbia, Washington, and Idaho (AOU 1998). My photo (left) is of one of those vagrants. Rita and I flew to Boise, Idaho, and drove to Hailey, a famed ski resort, to chase this one in winter 1997. The bird moved around quite a bit and it took a long, cold wait in the snow until it briefly appeared at the backyard feeder it had been frequenting. It was really fine to see an accentor in the New World as it was a bird oh so far from home. Most accentors are 'stone-colored,' to use a phrase from Cramp (1988). They are mostly patterned in gray, brown, or rusty, often streaked above but buff or dull-colored below. Brown Accentor (right) is one of those that match this description. It is a bird of high mountains in central Asia and the Himalayas. There are accentors restricted to the Japanese and Kurile Islands (Japanese Accentor P. rubida), to arid mountains from Turkey to Iran (Spot-throated Accentor P. ocularis), and another a breeding endemic in high mountains of Yemen (Yemen Accentor P. fagani). A number of central Asia species move south and downslope to the Himalayan foothills in winter. My first accentor was that alpine specialist, Alpine Accentor P. collaris — seen at the edge of Grossglockner Glacier in Austria back in 1969. In most species, sexes appear alike or only slightly different. Nests tend to be compact cups placed in a thick shrub, close to the ground. In Dunnock, only the female incubates but both sexes feed the young. There is some really fascinating behavioral mechanisms in Dunnock that the male uses in an attempt to assure that the offspring are actually his; some remarkable footage is in David Attenborough's Life of Birds video series. 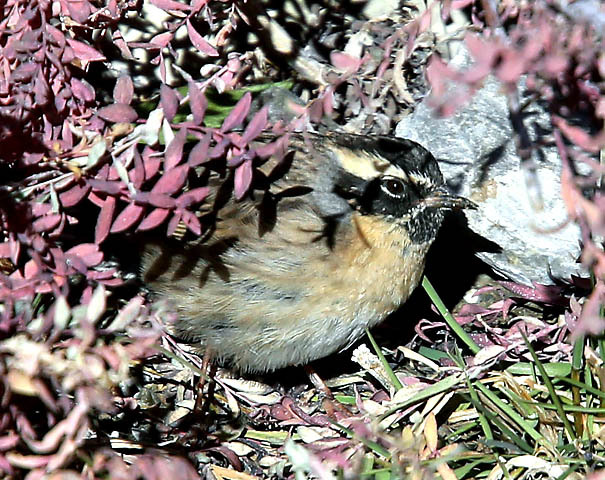 Photos: Matt Matthiessen photographed the male Black-throated Accentor Prunella atrogularis in the Rumbak Valley, Hemis NP, India, on 31 Oct 2014; Matt discovered this migrant near our camp and I was able to see it. 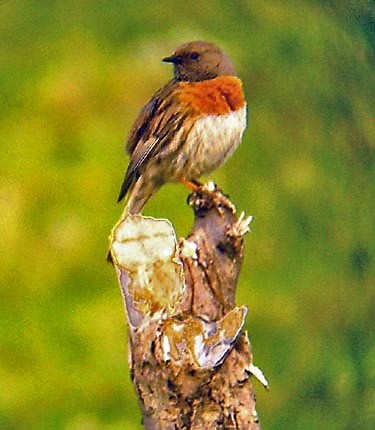 The Robin Accentor P. rebeculoides was photographed on ridge above Qinghai Lake, Qinghai, China, on 18 June 2004. 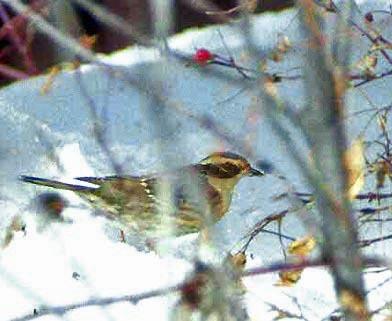 The Siberian Accentor P. montanella was a vagrant at Hailey, Idaho, USA, where it wintered; my photo was taken 1 Feb 1997. The Brown Accentor P. fulvescens was at Huzu Bei Shan National Park, Qinghai, China, on 22 June 2004. Uncredited photos © Don Roberson. Credited photos © Matt Matthiessen, as credited, and used with permission; all rights reserved. Bibliographic note: There is no "family book" per se, but a fine introduction to this family, with very nice photos, is in Hatchwell (2005). Good coverage of Eurasian species is in Cramp (1988) with many Asian species covered by Grimmett et al. (1998). American Ornithologists' Union. 1998. A.O.U. Check-List of North American Birds. 7th ed. A.O.U., Washington, D.C.
Cramp, S., ed. 1988. Handbook of Europe, the Middle East, and North Africa: The Birds of the Western Palearctic. Vol. 5. Oxford Univ. Press, Oxford. Grimmett, R., C. Inskipp, and T. Inskipp. 1998. Birds of the Indian Subcontinent. Christopher Helm, London. Hatchwell, B.J. 2005. Family Prunellidae (Accentors), pp. 496–513 in Handbook of the Birds of the World (del Hoyo, J., A. Elliott & D.A. Christie, eds). Vol. 10. Lynx Edicions, Barcelona, Spain.